Preparations are underway for Mercer’s largest plant sale of the year! Help us create a bigger, better event by becoming a March Mart volunteer! Greenhouse volunteers ages 16 and up are needed on Tuesdays, Wednesdays, Thursdays, and select Saturdays from 9 a.m. to noon in February and March. Volunteer opportunities at the greenhouses include repotting plants, weeding existing potted plants, moving plants, watering, and more. Volunteers can help in various stages of growing and plant maintenance. Youth and adult volunteers also can volunteer during March Mart Friday, March 15, and Saturday, March 16. “There are plenty of opportunities at March Mart, including volunteer check-in, plant ticket writing, wagon check-out, hospitality and more,” says Jamie Hartwell, Mercer volunteer coordinator. 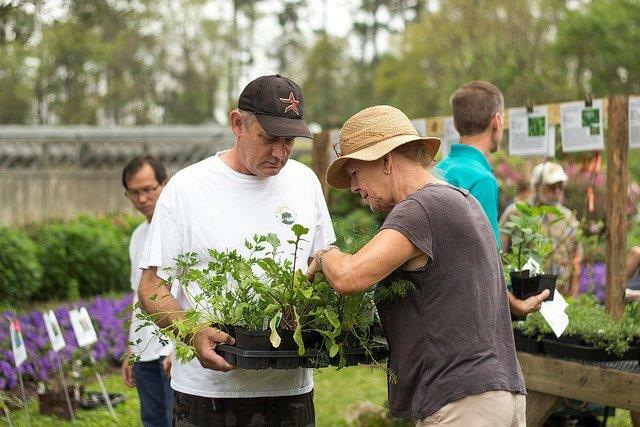 To volunteer for the March Mart plant sale or inquire about opportunities, please complete a March Mart application here. Applications also are available at the Mercer Botanic Gardens office at 22306 Aldine Westfield Road in Humble and Mercer Botanical Center at 25240 Aldine Westfield Road (at the corner of Aldine Westfield and Titleist Drive) in Spring.